Fall is upon us and you know what that means? Fall festivals, carnivals, and all the best holidays! Are you thinking of hosting a party or large event this year? Well, then you have come to the right place. 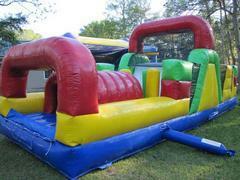 Leap Joy Inflatables has the best party rentals including an inflatable obstacle course rental. Our obstacle courses are truly a sight to see! They are large enough to entertain lots of eager jumpers but compact enough to fit in most backyards. Our most popular course is our turbo obstacle course and it’s easy to see why! This rental has a double slide! That’s right! Double the slide, double the fun! Click here to see the awesome course and all of the others too. Another great party rental is our dunk tank rental! This is a real crowd pleaser whether you are the dunker, the dunkee, or just a spectator. Thank you for choosing Leap Joy Inflatables for all your party rentals in Statesboro! We know you will be satisfied with your inflatable obstacle course rental because we keep your safety and satisfaction priority at all times. Please contact us today with any questions you may have or to get your rentals ordered today.